We live in a transitional age where most students still derive a significant portion of their training material from a paperbound textbook. It’s really amazing this textbook cabal system has been in place for a half a century-it’s been one of the root causes in the skyrocketing cost and inaccessibility of higher education in America. Indirectly-a whole hell of a lot. One of the main purposes of this website is to catalog and review currently available low-cost alternatives. One way is the use of free lecture notes and online text-books. However, I said in the introduction to the Lecture Notes Library, as rich, diverse and useful as they are, their lack of careful proofreading & inherently transient nature creates difficulties in using them as your sole source of education, particularly for beginners. Which is why I’m in the process of writing the definitive, comprehensive e-book guide to the currently available textbooks for 30 dollars and under each, The Debtor’s Doctorate: The Mathemagican’s Guide To Affordable Mathematics Textbooks From Secondary School to PhD Level. The following reviews were culled from this forthcoming book-which is why you should fully expect this page to be one of the more transitory parts of the site, undergoing fairly regular revision. They will not only provide a free partial guide to the literature, but a sampling of the larger tome upon which you can decide whether or not to buy it for your further edification. I hope the book will be completed and posted for sale in both an inexpensive paperback and e-book version by Spring 2018. Moreover, it's the first of a projected trilogy:Clever Cramming: The Mathemagician's Guide To The Best Mathematics Study Guides and The Forgotten Library:The Mathemagician's Guide To The Best Out Of Print Mathematics Textbooks will both be completed and available by Christmas 2019 (I hope!). The guide that follows are of the books I deemed, of the many I’ve read and owned, the best written and most useful of the available ones in this price range. It goes without saying books I haven’t read myself aren’t on the list (duh). I decided not to try and list the books in order of my personal favoritism-although I reserve the right to do this at some future date if there’s enough demand for it. That being said, all the titles are accompanied by my review and ratings by the same academic difficulty rating system I used for the lecture notes. My hope is to provide autodidacts looking to purchase some of the low-cost books available now a list of the books I think no library should be without. Sadly,with a few exceptions,the highest level the books that currently exist go to is first year graduate level ( rating R on our rating system).More advanced subjects, such as operator theory and advanced algebraic geometry,don't have inexpensive hard copy books yet. Fortunately, there is a legion of online lecture notes that can be found for these subjects in the online lecture notes section. You'll notice there are some commonly used cheap sources that aren't present on the list,primarily study guides like the Schaum's Outlines. I decided to focus on actual textbooks in both this list and its source book because there's relatively few of them. To me, these books-and study guides in general-require a separate treatment, which I'll provide in the second book I'm writing. When that's complete, I'll add a corresponding page to the website. So without further ado, here’s some of the crème de la creme of rustic mathematics texts. Algebra by I. M.Gelfand This is the first in a brilliant sequence of precalculus textbooks planned and co-written by Gelfand to train high school students for high level university science and mathematics programs, first in the Soviet Union and later in the United States. There’s really no point in writing a list like this that begins at this level if you’re not going to include these gems. Of the tons and tons of high school algebra textbooks out there, both new and old, this is the only one I can honestly say deserves to be recommended as a classic to everyone and their students. To me, the mark of a truly classic educational work is that regardless of level,it has something to teach everyone who reads it, from student to professional. Gelfand’s text certainly fits this criteria. A lot of books claim to begin from scratch, but Gelfand’s truly does-with basic arithmetic, done from a sophisticated viewpoint. He doesn’t build the number systems or introduce any abstract algebra, but he does ask the careful questions bright children might ask. And that’s really where all mathematical understanding really begins, isn’t it? Geometry is related to algebra and the author doesn’t hesitate to give careful arguments and demonstrations why this is so. The basics are covered-square roots, completing the square, etc.Polynomial interpolation, commonly called “long division” by high schoolers, is given probably the clearest and most careful treatment at this level I’ve ever seen. There are also many basic concepts we usually take for granted in a high school student that may or may not be covered, such as arithmetic and geometric progressions-including an important application students in American schools never see anymore, the modeling of the notes of a well tempered piano by a geometric progression of frequencies. The book finishes with a beautiful flourish of basic inequalities which all of us wish we’d learned at that level. All this beautiful stuff is presented literarily and in a crystal clear manner by Gelfand’s masterful prose with tons of simple but informative examples. This is one of the books we all wish we’d been given in high school-a book that not only informs, but inspires. The book is truly inspiring, making one think and see basic mathematics as magical and not torturous. A true classic and one no library-either for teachers,students or professionals-should be without. I’m estatic it’s still available so cheaply. Trigonometry by I.M. Gelfand and Mark Saul The second book in the aforementioned sequence of precalculus textbooks builds beautifully on the first. 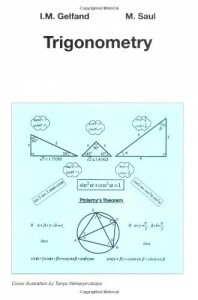 The theme of this book is to use the trigonometric functions to establish the careful connection between basic algebra and basic geometry that results in the creation of analytic geometry. Again, all the basics are developed-the sine, cosine and tangent functions, the Laws of Sine and Cosine, the Pythagorean Theorem and more. There are tons of worked examples and challenging exercises. But the central idea throughout is that trigonometry is the study of periodic functions and these periodic functions are critical throughout mathematics, particularly calculus. The book is specifically geared to prepare students for calculus. One of the main problems most of today’s students in basic calculus have-among many-is weakness in trigonometry. A careful study of this book would help such students immensely. Another classic where the authors treat beginners from the standpoint of mature mathematics while still remaining at the appropriate shallow end of the pool. Most highly recommended. 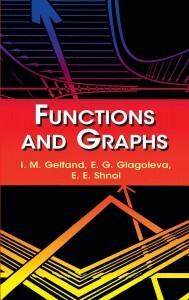 Functions and Graphs by I.M. Gel'fand ,E.G. Glagoleva and E.E. Shnol : (G) The third book in this wonderful series by Gel’fand and his co-authors is exactly what the title says it is- a mathematically sound tome for beginners on the myriad of functions and their graphs in the plane and how the latter informs us greatly about the behavior and properties of the former. 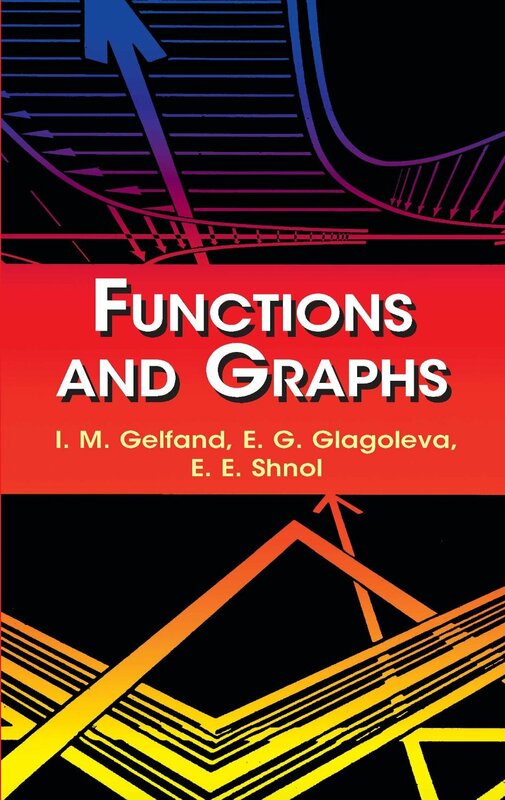 It’s wonderfully pictorial and intuitive, with graphs on every page and every conceivable function one would find in pre-calculus courses. The main emphasis of the book is on the technique of “shifting” graphs i.e. translation through the coordinate system of the Cartesian plane. This is an absolutely critical basic skill for students and it’s surprising how many calculus and geometry students are weak in it. 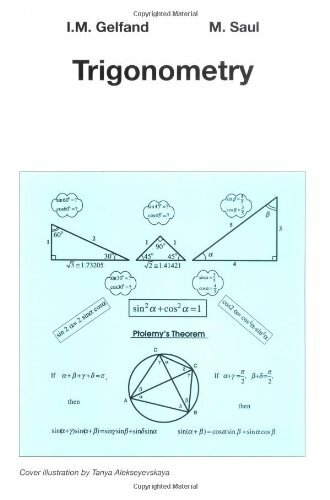 Together with the aforementioned book on trigonometry, a good high school geometry course textbook, such as Kiselev’s texts to be discussed in the next section-I can’t think of better preparation for a strong calculus course. Another jewel by Gelfand and his coauthors for beginners. prose and conceptual clarity. This-his last and most elementary textbook- is no exception. minimum of algebra, geometry and trigonometry needed to effectively and carefully learn calculus.The contents are therefore highly selective and focused-nothing is developed which isn't needed to understand either calculus itself or the analytic geometry which is inseparable from it and it's applications. By necessity, the book is less detailed then the texts by Gefland above. But for students and teachers that are interested in a comprehensive but focused introduction to the fundamentals needed before embarking on a serious calculus course such as Silverman's below, this is as good as you're going to find. The book has 3 sections: algebra, geometry and trigonometry-and all 3 are covered with both care and clarity. There are many, many pictures as well as the author's usual dry wit and masterful organization. The last chapter on trigonometry,in particular, is probably the best short introduction to the subject that currently exists. The great shame of this book is that it's the only one by Simmons that's currently available in our price range. We should all push for the remarkable textbooks of this fine author and mathematician to be reissued in cheap editions for future generations. In the meantime, beginning students and teachers have this jewel to treasure. Modern Calculus and Analytic Geometry Yes, that Silverman, the one behind many excellent translations of classic Russian textbooks that Dover has republished so many of-such as the 3 volume treatise on complex analysis by Markushevich. Apparently this was one of the first books he completed after finishing his PhD at Harvard in the 1960's. Back then, during the Golden Age of American Education, this could pass for an honors calculus text at an average university. No longer. Now, it would be a truly superior student indeed who could handle the more theoretical parts of the book-which includes precise definitions of ordered pairs, relations and functions, a full development of the real numbers based entirely on decimal expansions rather than Dedekind cuts or Cauchy sequences. This last part in particular is fascinating since it’s a method of construction of R that mathematicians usually avoid like live HIV virus because it’s by far, the most complicated and tedious method of constructing the reals from the rationals. But the advantage of this method is that conceptually, it is the simplest construction. This demonstrates the underlying philosophy of the book: Maintain the intuitive, physical/geometric aspects of calculus, but prove everything in the simplest manner possible. The result is a completely rigorous presentation of both single variable and classical multivariable calculus in modern language (i.e. done with rigorous set-theoretic constructions and linear algebra but no manifolds or differential form theory). The book also has a lot of nice examples, which is unusual in calculus books this old. This is probably my favorite of all the Dover calculus books and I’m seriously considering trying to build an honors calculus course around it. The Calculus Lifesaver: All the Tools You Need to Excel at Calculus A new classic. This is the book all of us wish we’d had when we first started learning calculus. In softcover, it’s cheap enough to make the list. Adrian Banner developed this book out of an intensive tutorial session for freshmen and high school students he taught for several years-and the experience shows. It is rigorous without being abstract, has tons of pictures to go with the beautiful, well-thought out explanations and proofs and almost 500 step-by-step solved problems. Banner’s explanations should be studied by any budding teacher or professor as models of clarity and depth, teaching not only the concepts of calculus but problem solving techniques and strategies. All this and for free, you get the legendary video series of Banner’s lectures as well as additional video lessons at http://press.princeton.edu/video/banner/. This is a must-have, not only for all students taking calculus for the first time, but all instructors teaching it. The one drawback it has is that it only covers single-variable calculus. Here’s hoping sections on multivariable calculus and basic linear algebra are in the offering from Banner in either a second edition or a sequel. Calculus for the Ambitious by Tom Korner I did a double take when I first learned this book was coming out. Korner is not only a first-rate mathematician, he may be the very best mathematics textbook author going these days. From his wonderful “shop-window” text on Fourier analysis to his tour de force on intermediate undergraduate real analysis to his incredible recent text on linear algebra for both mathematicians and physicists, he has authored some of the deepest and most vivaciously written texts for serious students that are currently available. This is not a textbook on calculus in the formal sense.It’s an informal supplementary text for such a course and for young mathematics students just beginning their studies in calculus and have no clue what it’s about. And just like in all of Korner’s other textbooks, it’s incredibly well written, masterly and has remarkable insight into its chosen subject matter like no other book in its genre. In just 180 (!) pages, Korner gives virtually complete coverage of the basic ideas of calculus-from basic ideas of derivative, limit, continuity and integral to the elements of single and multivariable calculus through the basic questions surrounding the real numbers and the imprecision of “intuitive” calculus through the basic ideas of the construction of the real numbers and the beginnings of rigorous analysis. There are no formal proofs, but on every page, there’s a plethora of ideas and razor sharp clarity in the exposition of those ideas. So many of us learn and/or teach calculus, but so few of us can really present a truly deep conceptual understanding of the immensely subtle and beautiful ideas of calculus in a first course to beginners. Korner doesn’t just do this, he provides a complete and incredibly deep deconstruction of the basic ideas of both calculus and analysis in a literary manner that will provide remarkable insight into this central subject for all readers-from high school to seasoned teacher of calculus or real analysis. A remarkable course in calculus could be taught from it in conjunction with a standard text. It’s the kind of book that regardless of how many times you pick it up, you’ll find a new comment or insight you didn’t see before. I’m so happy this amazing book is available for a mere 28 dollars. Please go get a copy, regardless of your level of calculus knowledge. It will become one of your most used and treasured texts in your library, trust me. Finite Dimensional Vector Spaces by Paul Halmos (PG/PG-13)If you’ve never heard of the late Paul Halmos, then you’ve been sadly deprived in your education. Halmos was a Hungarian born, American raised mathematician who worked at several major universities in the US, most notably the University of Chicago. He was probably best known for his remarkable autobiography, I Want To Be A Mathematician- which was one of my major inspirations for switching from chemistry to mathematics. I still reread it from time to time for not only inspiration, but Halmos’ wonderful commentary on mathematics which is so eminently quotable. I heartily recommend anyone interested in mathematics and the practice of mathematics to beg, borrow or steal a copy. In addition, he was known for his advanced textbooks on a host of topics for which there were no accessible treatments before his textbooks. Most of his textbooks have recently been reissued by Martino Fine Books in very inexpensive paperbacks-which is great news for all of us. This was probably his most influential one. FDVS was a historically critical book-it was the first real textbook on linear algebra. Until Halmos wrote it, the teaching of linear algebra as a separate subject to undergraduates was not something that was common in university curricula-as strange as that seems to students and professors today. Matrices, vector spaces and linear transformations were topics that were either taught in detail as part of abstract algebra courses or on a need to know basis in graduate courses in functional analysis. By the early 1960’s, the need to introduce linear algebra much earlier and in much greater detail in a students’ training as a foundation for a myriad of subjects was generally accepted. Halmos’ book went a long way towards making this revision practical. That being said, those who expect a standard linear algebra text are going to be taken aback when they open it. Halmos’ inspiration for the book was the first part of John Von Neumann’s lectures at Princeton in the 1940’s on operator theory, which were pitched at graduate students and professionals. What Halmos wanted to produce was a finite-dimensional version of the vector space concepts in those notes for students preparing to study functional analysis. As a result, the book is pitched at a much higher level than one expects in a modern linear algebra course. The emphasis is on linear transformations and dual spaces-matrices don’t even appear until halfway through the book. The book also has many sidebars into modern analysis in finite dimensions, such as bounded normed spaces and an introduction to Hilbert space. While these sidebars are important and fascinating, it’s kind of hard to justify such topics in a beginning linear algebra course these days. It’s also quite a bit terser then books on linear algebra tend to be-almost half the results are in the exercises. The author was a firm believer that mathematics has to be learned with pen and paper in hand-and it’s hard to argue with this sentiment. As a result, even talented beginning students with little rigorous mathematics background may find it overwhelming. That being said-Halmos is one of the clearest, most insightful mathematics textbook authors that has ever put pen to paper. The book has many examples-most drawn from classical geometry, where the connection between the 2 subjects is one of the book’s focuses. His book is a model of clarity and students that work through it will come away with a wonderful understanding of the subject-and a better understanding of abstract linear mappings then most standard books give. I’d have a lot of trouble recommending it to students just beginning to learn these concepts, even really strong students. But it certainly would make a terrific first course for honors students or a second course for math majors-and at this price, why in the name of the ghost of Irving Kaplansky wouldn’t you want a copy? Highly recommended for strong and advanced students only. Vector Calculus by Peter Baxandall and Hans Leibeck (PG) I stumbled across this terrific and very underrated book while searching for a modern treatment of functions of several variables that could be used by bright undergraduates without the use of manifolds or differential forms. This is one of the best available. The overwhelming majority of such books are basically plug and chug books that may as well have been written in the 19th century and avoid any hard theory like Lyme Disease. Most of them are afraid to discuss linear transformations and vector spaces, for God’s sake. Such books are obviously mostly written for engineering and non-mathematics students, assuming that honors mathematics and physics majors would opt into courses and texts based in differentiable manifolds. Like I said above, this is a highly questionable assumption to say the least and even if it were true, a careful study of vector valued functions in R2 and R3 first might allow students to transition directly to modern differential topology and geometry without the “forms for dummies” approach. In any event, this wonderful textbook is rooted in the UK university system and therefore begins at a higher level them most American texts. begins in the simplest manner and gradually achieves full generality. The standard concepts-such as chain rule, the inverse and implicit function theorems and multiple integrals-are presented several times at different levels of generality. The language of linear algebra is used freely and without reservation, careful definitions are given & the presentation is still extremely visual as each concept is given with several graphs. Even better, the presentation is example driven-there are literally hundreds of examples throughout-from both mathematics and classical physics. And it’s all topped off with lots of equally terrific exercises, none too hard. differential geometry. The highest possible recommendation! Introduction to Analysis by Arthur Mattuck (PG) I was absolutely floored to learn this incredible book was reissued in a fantastically cheap paperback after becoming exceedingly scarce-and correspondingly expensive-in it’s original hardcover edition. Mattuck’s reissuing of the book through Createspace in a 13 USD price edition as the standard text for the 18.100A course at MIT, which he has taught there for many years, demonstrates this legendary teacher’s commitment to assisting students learn analysis who do not have the strong background and/or talent of students who can directly enter an abstract analysis course based on metric spaces. property.The aim is to get to interesting things as quickly as possible. Several appendices present extended applications. Point-set topology, the pons asinorum of analysis courses, has been banished to near the end, and presented in abbreviated form, just before it is needed in the study of integrals depending on a parameter. By then, students can understand the arguments, and even enjoy them as something new-looking. beginning students of analysis and there’s no reason not to have a copy now. Run and order a copy. You’ll thank me later, trust me. hasn’t changed much, so this will largely be a truncated version of that review. wonderful and unusual text, that reputation was well deserved. it’s inherently very visual because then the geometry of Rn is naturally tied to the analytic properties. There are many, many pictures — the geometric perspective makes this very natural and not forced as in many analysis texts. Also, not only does it allow a unified treatment of the real line and all its generalizations to higher dimensions, it also provides the natural basis for later studies of functional analysis and harmonic analysis, which generally emphasize the properties of Hilbert and Banach spaces as normed rather then topological spaces. So a course based on this book provides a natural and straightforward foundation for such advanced courses. undergraduate and it still amazes me. It’s probably the single most complete reference/textbook on the subject that’s ever been written. virtually the whole of point set theory;he distinguishes two broad areas of topology: "continuous topology,"
overview of the history of the development of each topic in point set topology. Even if you don’t particularly care for point-set topology-as sadly a lot of research oriented students don’t and are encouraged to feel that way-there’s really no good reason not to have this wonderful book now. Before moving on, I just wanted to alert readers who may not be aware of it: Besides Willard, there are 2 other equally comprehensive textbooks on general topology, the books by Ryxzard Engelking and James Dugundiji. Engelking is nearly unobtainable in the U.S and it’s insanely expensive to order from Heldermann-Verlag. Dugundiji is long out of print. So until either becomes available in the U.S. again in inexpensive editions, Willard is really your best bet for such a text. Topological Methods in Euclidean Spaces by Gregory Naber (PG) Alright, everyone stop reading and pay attention. This is the single best textbook on topology that has ever been written for undergraduates. Ever. Got that? I’m dead serious. I know I’m going to get a lot of blowback and fights for this statement and it’s still possible I’ll find a better one or change my opinion in the coming years. But as it stands right now, this is the best one ever for anyone who doesn’t know anything substantial about topology and is seriously thinking about graduate school in mathematics. Better then McCleary or Crossley. And yes, for undergraduates, better then James Munkres' classic-may the Gods of mathematics forgive me and may James Munkres forgive me! Spacetime and the 2 volume definitive treatise on the mathematics of gauge theory, Topology, Geometry And Gauge Fields. due to Naber’s remarkable penchant for seamlessly integrating mathematical rigor and comprehensiveness with a talent for concrete computations and examples. This book is very much in that tradition. The entire text is laid out entirely in Euclidean spaces without the abstract definition of a topological space appearing anywhere in the text. This is part of Naber’s strategy of utilizing all the familiar machinery of both calculus and geometry to describe the concepts of “nearness” (metrics) , open and closed balls, continuity, connectedness, compactness, the fundamental group and homotopy theory, simplexes and their associated techniques such as the Brower theorem and triangulations, the basics of homology theory in Euclidean spaces, including an elementary discussion of homological algebra and diagram chasing! The amazing thing is that all this beautiful material is described very geometrically with many pictures and yet in completely modern language-and at a level any student with a standard US undergraduate mathematics major can understand. Many wonderful examples are embedded in the presentation. Naber concludes his textbook with a great list of recommendations for further reading, containing commentary on some of the subject’s true classics. It’s hard to imagine any undergraduate who works through and masters this wonderful book having anything less then a full overview of the entire field of modern topology in Euclidean spaces when they finish and they’ll be well-equipped for graduate courses. I can’t recommend this book highly enough! Counterexamples in Topology by Lynn Arthur Steen and J. Arthur Seebach Jr. This was the first of 2 famous textbooks on counterexamples reissued by Dover, the other being the one on basic analysis here. I don’t think this book is as well organized or written as Gelbaum and Olmsted’s book. That being said, just about every wacky topological space and crazy mapping on them is described in here and in detail and it even contains a rapid review of point set topology. So since Dover has it available so cheap and this material can’t really be found elsewhere without half a dozen topology textbooks on hand, why shouldn’t you get it? the properties of the integers. For example, he proves Wilson’s theorem by a rather lengthy but very clever and clear graph-theoretic argument of the number of edges that can be constructed from a bisected circle with p points on the boundary. Generating functions are introduced early and used as a major calculational tool in the derivation of partition generating functions, which is used to give an introduction to additive number theory (one of my areas of research, which has expanded dramatically since this book was written) . Surprisingly, Andrews also shows a converse relation i.e. how results in number theory can be used to solve problems in combinatorics. For example, he demonstrates how Fermat’s little theorem can be used to derive results about riffling phenomena. Wonderful and unexpected results like this are sprinkled through Andrews’ book-this plus the literate, relaxed style of his writing make this a very original classic of the subject and there’s absolutely no reason not to have it in this cheap edition. students taking differential equations for the first time are still completely unaware of it. Simmons was one of the great textbook authors in mathematics and he has written several textbooks which were gems for the ages, mostly in calculus and topology.) My point is that Tenebaum/Pollard is of the few texts on DE, in an age of literally tons of contenders, that I would recommend or assign to minimally prepared undergraduates first learning the subject who are serious about it. properties of second order linear differential equations. professor teaching it for the first time. to Partial Differential Equations with Applications by E. C.
examples and important applications to the physical sciences. good exercises for the beginner. more recent coloring results-are missing. But it’s still a very good and cheap introduction. to stop everything and run out and get this book. yourself a copy. You'll thank me. introduces closed transformations, proves thc closed graph theorem and the bounded inverse theorem. discusses properties of adjoint opcrators in a Hilbert space, sesquilincar functionals and quadratic forms. above, I can't think of a better introduction to graduate level analysis. The highest possible recommendation! recent reissue of this classic. The late Nathan Jacobson, of course, was one of the giants of non-commutative ring theory in the 20th century. republication of the second edition. presentation and depth of understanding. and a must have for any graduate student. could actually read and understand. He’d used Lang, Hungerford and Jacobson for the course with mixed results. copies floating around for much less. to crack it open and discover the many marvels waiting therein. Semi-Riemannian manifolds. There are 2 unique aspects of the text. textbook that it written for both mathematics and physics students. their diagram chasing be dirtied by any association with physics. chosen to republish over the years. for anyone who wanted or needed knowledge of these subjects. undergraduate/ first year graduate students in mathematics or advanced graduate students in philosophy. Theory and the Foundations of Mathematics. Logic and Notation. and Definitions. Axioms of Extensionality and Separation. Intersection, Union, and Difference of Sets. Pairing Axiom and Ordered Pairs. and General Properties of Ordinals. Recursion. Elements of Ordinal Arithmetic. Alephs. Well-Ordered Sets. CHAPTER 8. Some Applications of the Axiom of Choice. Which Imply the Axiom of Choice. confusingly-is done in ordinary language. the essentials of mathematical logic. sell their cars to get a hold of. that really approximates the pace and coverage of the actual course. indeed. Very highly recommended-if you dare.